San Mateo, Calif. – October 23, 2014 – Speck, the award-winning leader of mighty slim protective cases and covers for smartphones, tablets and laptops, today announced the availability of new iPad Air 2 cases and iPad mini 3 cases. The new lineup of iPad cases includes #1 selling tablet case in the U.S.* StyleFolio, rugged military-grade protective DuraFolio, and the ever popular and most huggable Speck case, iGuy. 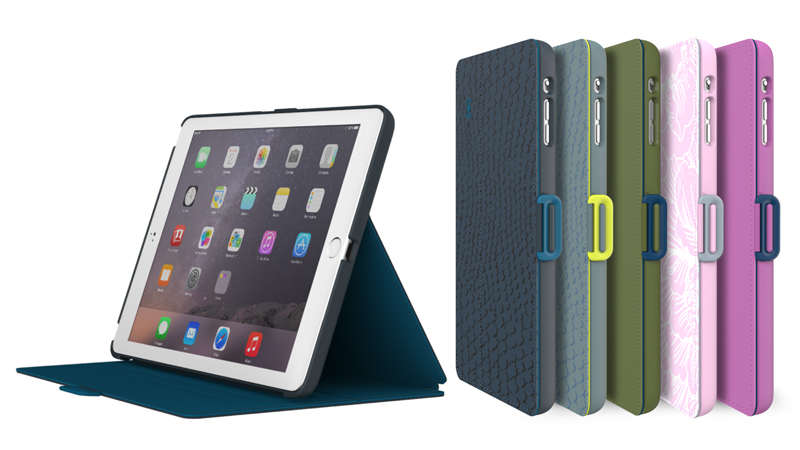 Each of the new iPad Air 2 cases and iPad mini 3 cases embody a unique and innovative spin on protection – slim style, rugged durability, and free-standing fun. StyleFolio and iGuy cases will fit all iPad Air from 2013-2014 and iPad mini models from 2012-2014, including iPad Air, iPad mini and iPad mini 2 (with Retina display), plus the newest models. DuraFolio cases will be specific to iPad Air and iPad mini 2012 and 2014 models. StyleFolio for iPad Air 2 and iPad mini 3 ($34.95-$39.95) is the latest version of the #1 selling tablet case from Speck and for the first time ever features backward compatibility to fit both the 2013 and 2014 models of iPad Air. Vivid colors and high-res patterns add sharpness to StyleFolio’s easy-to-clean vegan leather cover for a seamless, impeccable design. Auto sleep/wake magnets make turning your iPad on and off a cinch. Multiple viewing angles make sure you’ll find the perfect angle, while a secure closure clasp holds your cover either folded or shut for when you’re on-the-go. DuraFolio for iPad Air 2 and iPad mini 3 ($49.95-$59.95) provides military-grade protection against drops while maintaining a slim profile that only adds 0.3” to the device. The magnetic cover automatically awakens and puts to sleep the device on open and close, to provide a secure seal that protects the screen while not in use. DuraFolio for iPad Air 2 has a reinforced, taller bezel, extended lip inside the cover for secure closure, and a textured finish to add extra grip and durability for unsurpassed defense. iGuy for iPad Air 2 and iPad mini 3 ($29.95-$39.95) is just as protective as he is fun to play with, making him the perfect playmate for kids young and old. His protective yet flexible foam construction is ideal for small hands and not-so-gentle drops. Plus, iGuy stands on his own two feet for tabletop viewing the whole family can enjoy. All Speck cases for the new iPad Air 2 and iPad mini 3 will be available at speckproducts.com and select retailers nationwide. * The NPD Group/Retail Tracking Service: Tablet & E-Reader Cases Units Sold, YTD period ending September 2014.